A YouTube channel run by one who has many voices & faces. The last video uploaded to the channel was "An Onision Character Is BACK! ", uploaded on September 11, 2018. ($ource) Around that time, Greg made an announcement on three other channels that he was no longer uploading videos to those channels. 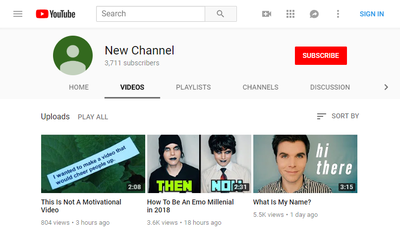 It was assumed New Channel was discontinued as well. This page was last modified on 13 November 2018, at 09:48.